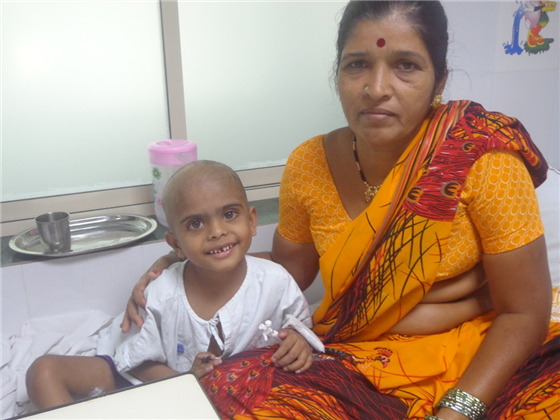 As our supporters will know, we made an appeal last month on behalf of Vignesh, one of our balwadi students diagnosed with blood cancer, who is now undergoing treatment at Holy Spirit Hospital, under our HOPE: Care for Children with Cancer project. Vignesh Chavan is a cute four-year-old who loves to play and kid around with his older brother. For one year he was a student at our balwadi no 23 in Sangharsh Nagar, where he has shown great promise. He is also a cancer patient, suffering from an acute form of blood cancer, battling circumstances and a deadly disease, in order to survive. In July this year, Vignesh developed a recurring fever. The family — his father, Ankush Chavan (32), is a security guard with a private company, mother Vaishali (28) is a housewife, and older brother Aditya (6) is a student — began doing the rounds of doctors and hospitals. They first took him to a local doctor who referred them to Hiranandani Hospital, where they treated him for a while; but, suspecting there was a more serious problem, the doctors then referred Vignesh to Tata Memorial Hospital, which is a comprehensive cancer care centre. 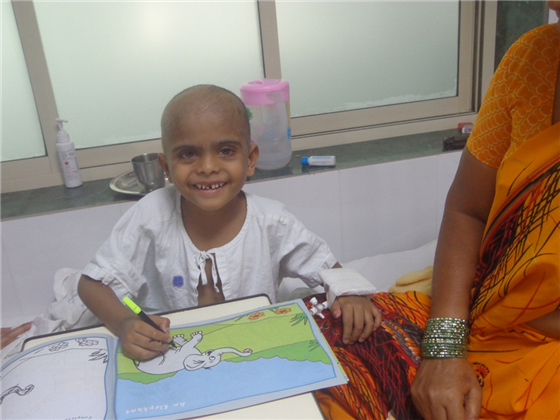 Initial tests came back normal, Vignesh’s health began to improve, and he went back to the balwadi and playing with his friends. However, after two months, the fever came back. The family took him to the Lokmanya Tilak Municipal General Hospital also known as Sion Hospital (which is a public hospital), where a doctor suggested a bone marrow test at Tata Memorial Hospital. The test was done, and Vignesh was diagnosed with Acute Myeloid Leukaemia, which a rare and severe type of blood cancer. 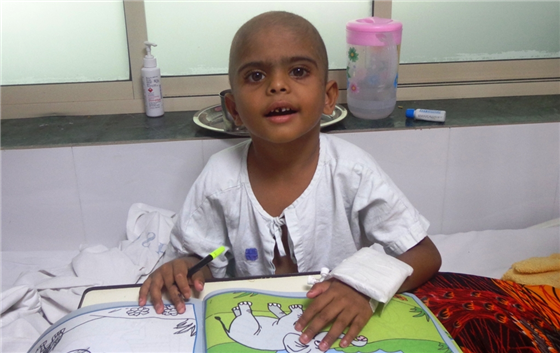 Vignesh, a chirpy and active toddler, became so weak that he is barely able to sit. 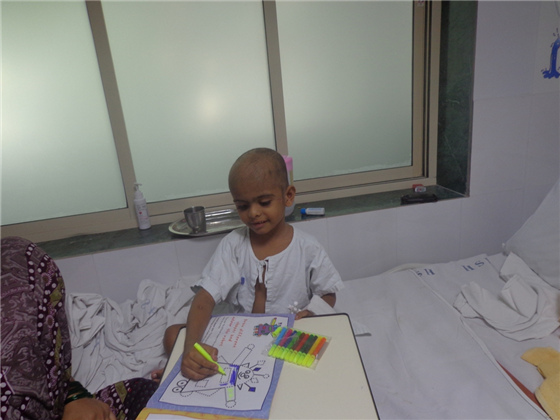 The Mumbai Smiles balwadi project team came to know of his situation and directed him to Holy Spirit Hospital, where we run our HOPE: Care for Children with Cancer project. He is being treated here by Dr Suverna Achrekar. With sustained hospital stay and dedicated care, Vignesh’s condition has stabilised. But, the family is dealing with a parallel crisis. Vignesh’s father, Ankush, is the only earning member of the family and makes a mere Rs 4,000 a month as a security guard. They had previously spent Rs 3,00,000 on their baby boy’s treatment, raising the money by borrowing from family and selling off jewellery and bits of land. They will need another Rs 7,00,000 for further treatment. Help Vignesh beat this cancer. Along with his family and the social workers at Holy Spirit Hospital, we are desperately trying to raise funds for this little boy’s treatment. After our last appeal, we managed to raise Rs 1,20,000 from donors, but we need more. And we truly believe that all of you can help, even in the smallest ways possible. If you would like to donate some funds or can help in any other way, please contact Aditi Seshadri at 91-9867552332 or communication@mumbaismiles.org. If you would like to know more about Mumbai Smiles and our work, please visit www.mumbaismiles.org. Next PostBags and toys: Thank you Mr Chugani!